The Bonavita BV 1900TS is a one touch drip/pour over brewer that produces up to 8 cups of coffee (making a total capacity of 40oz). The coffee is brewed at an optimal temperature of 195F to 205F. Rather than a hotplate, the brewed coffee is kept warm via a steel-lined thermal carafe. While the start time is not programmable, the 1900TS does have a pre-infusion program that moistens the grounds before brewing, which releases the built-up carbon dioxide. It also features a large shower head and flat-bottomed filter for uniform extraction. The 1900TS is recognized by the Specialty Coffee Association of America (SCAA), as part of the Certified Home Brewer Program. In this Bonavita BV1900TS review, I’ll find out if it’s worth this premium rating. The first thing to appreciate about the Bonavita BV 1900TS is its stylish good looks. The compact, minimalist design suggests this is a quality brewer capable of producing great coffee and an incredible taste – and for the most part this is a pretty accurate assessment. Ease of Use: The second thing to notice about the 1900TS is the lack of controls. Indeed, aside from a simple on/off button and light, there is nothing else you can really adjust and no control panel. Turn the maker on, brew your coffee, and the machine automatically switches off after the cycle has completed. That’s about it! The lack of programmability means you can’t set a time for the brew cycle to start (you’ll want to check out the 1900TD model for that feature), which may limit its appeal if you like to wake up to the taste of a freshly-brewed coffee, or just need the convenience of setting a brew time. Pre-Infusion Mode: The one exception to the lack of programmability is the pre-infusion mode. By holding down the ‘on’ button for 5 seconds prior to brewing, you activate this optional 30-second program which acts to pre-moisten the coffee grounds before the actual 5-minute brew cycle starts. So, just in a few minutes, you will be able to enjoy a great coffee. In truth, this setting is quite fiddly at first and the lack of control panel or a dedicated button means it can be hard to decipher whether the pre-infusion mode has actually been activated, leading to a lot of peering and head scratching when no water is forthcoming. While Bonavita was obviously aiming for simple, one-touch functionality, in this case, a few more controls might have made this brewer even simpler to operate. High-Quality Coffee: Additional features on 1900TS include a flat-bottomed filter and large shower head. Both of these features promote coffee quality by helping to ensure optimal extraction. The manufacturer also claims the brew temperature reaches an optimal 195F to 205F (although some third-party reviews have disputed this). These features are all for one main aim – to produce the best possible taste for your cup of coffee. Storage: This extends to storage. Instead of a glass carafe and hotplate, the 1900TS features a steel-lined thermal carafe which acts like a thermos. The coffee brews directly into the carafe. Once it’s done, you simply screw the lid on and the coffee retains its heat for up to about 4 hours. It is recommended you pre-heat the carafe by filling it with hot water and emptying it out before brewing to ensure the coffee is stored at optimal heat for the longest possible time. The advantages of the carafe include less danger of breakages and, not surprisingly, enhanced coffee quality. Hotplates can burn the coffee, especially when only brewing a couple of cups or holding the coffee for hours, but with a carafe, the taste of the coffee remains as good as when it was first brewed. Unfortunately, the design of the 1900TS carafe makes it quite hard to pour from, especially when trying to get the last drops out. It also only fits into the brewer without its lid, so when you’re not brewing you need to store the lid separately – not really a big deal, but a little strange. Third-party reviews of the 1900TS have flagged such general issues as the poorly-designed carafe and questionable brew temperature. Other negative comments mainly relate to problems with individual brewers, which the manufacturer seems quite prompt at resolving. Before first use, you should run at least two brew cycles with plain water. Regular maintenance duties include wiping down the outside of the brewer with a soft cloth and warm, soapy water. The shower head and filter basket are dishwasher safe, as is the carafe lid. However, the carafe body should not be placed in the dishwasher. The manufacturer recommends using coffee machine cleaning powder to remove stains. Periodically, the 1900TS requires descaling. Bonavita recommends doing this every 100 brew cycles or 3 months, but frequency depends upon water hardness. To descale, run a brew cycle with a mixture of water and cleaning powder, followed by two brew cycles with plain water. Pros: The 1900TS is a premium brewer that offers quality at a reasonable price. The brewer has clearly been made with coffee quality in mind. It features a large shower head, flat bottomed filter, and pre-infusion mode, all of which promote optimal extraction. The powerful heater ensures the coffee brews at the best water temperature. The carafe is of good quality, keeping the coffee hot for up to 4 hours (when pre-heated). Cons: The design of the carafe makes it quite awkward (and messy) to use. The one-touch operation takes some time to get used to, especially when attempting to use the optional pre-infusion mode. The 1900TS is not programmable, so you can’t select a time to start your brew. In a sentence? 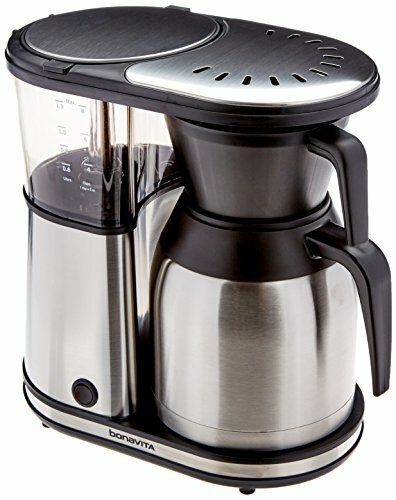 The Bonavita BV 1900TS is a high-quality, yet affordable, 8-cup thermal carafe drip coffee brewer that benefits from several premium features, including a pre-infusion mode, and it also boasts SCAA certification – however, if you want the added convenience of programmability, you’d be better off with Bonavita’s BV 1900TD model. Can I use the Bonavita BV1900TS to make a coffee that tastes like Starbucks? Yes! If you want you can replicate the flavour that Starbuck offers, just like a professional barista, this is the right coffee maker. The amazing and precise heater will help you to extract the finest coffee taste for your specialty coffee, and it will maintain the perfect temperature. You can experiment as much as you want, and even create a cold brew coffee. Exactly how much coffee does it make? What is their definition of a ‘cup’? The water reservoir has the capacity for 8 cups. Their definition of a cup is 5 ounces. Which means that this coffee maker has the capacity to make 40-ounces of coffee. Overall, the Bonavita BV 1900TS is a quality brewer that is capable of producing excellent taste coffee. It is a sturdy and classy-looking machine that is, for the most part, simple to use. Bonavita has cleverly stripped away the bells and whistles to produce a drip brewer for the discerning coffee drinker who prioritizes a quality brew over everything else. The 1500-watt heater, (optional) pre-infusion mode, flat-bottomed filter, and large shower head are all features that ensure the best possible extraction at the optimal temperature. 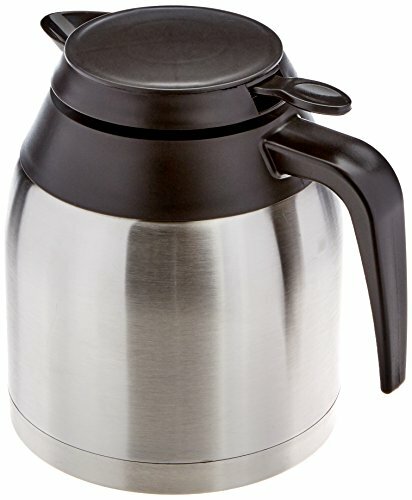 The durable carafe keeps the coffee warm for hours (when pre-heated with hot water) without the danger of burning, which can sometimes occur with drip brewers that use a hotplate/glass carafe. By using fresh, high-quality beans ground for drip coffee brewing, and clean, filtered water, you will likely be impressed by what the Bonavita BV 1900TS can do. By recognizing the 1900TS under its Certified Home Brewer Program, the SCAA agrees that this is a quality maker. There are some issues that might make you think twice before investing. While durable and well-insulated, the design of the carafe makes it quite awkward to use and pour from. Also, the lack of programmability may be a deal-breaker for some. Again, this is a coffee quality issue as it ensures fresh water is added for each brew. However, if this is an important feature, Bonavita has introduced its 1900TD model, which does allow you to program a start time and features a digital display. Finally, the Bonavita BV 1900TS is advertised as an 8-cup brewer, but this is based on 5oz servings. So, is the Bonavita BV 1900TS a worthwhile purchase? Well, while it may not be the ‘game changer’ some have suggested, this is certainly a quality maker that deserves a place on your shortlist. Be sure to check this listing for the latest pricing.